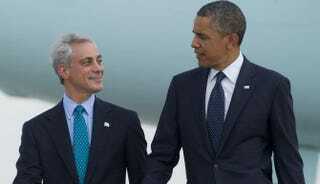 Chicago Mayor Rahm Emanuel and President Barack Obama. Emanuel was Obama’s first White House chief of staff. Chicago Mayor Rahm Emanuel has canceled plans to name an elite new high school for his former boss, President Barack Obama, the Chicago Tribune reports. Emanuel, Obama’s first White House chief of staff, said Thursday that he would consider other names for the selective-enrollment high school set to be built near the site of the former Cabrini-Green public housing project just northwest of downtown, which is now an upscale part of the city. Some members of the black community had expressed concern that the name was inappropriate for a school to be located in a wealthy, mainly white neighborhood. “Over the last few months, my team has listened to questions and concerns from the community, ranging from location of the building to the naming of the school. We take that community input seriously, which is why—as we continue to look for a thoughtful way to honor President Obama—we will look for other possible names for this future school,” Emanuel said in a statement, according to the Tribune. The name, the Barack Obama College Preparatory High School, was announced in April amid fanfare. It is slated to open for the 2017-2018 school year.